When I started thinking about this project, I knew I wanted to do something about color and the idea soon evolved into a sculptural project. I decided to use cellophane for its transparent quality because I wanted people to be able to explore how the three primary colors mix to form new colors. I prepared the pieces by cutting squares, circles, and triangles out of pieces of cardboard and cardstock and gluing the cellophane to them. Attached to cardboard, the cellophane became a much more manageable material and had the necessary structure to be assembled three dimensionally. 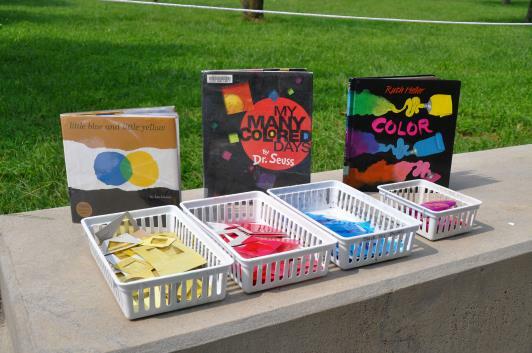 In Bobbie’s Meadow, we read Little Blue and Little Yellow by Leo Lionni, and My Many Colored Days by Dr. Seuss with paintings by Steve Johnson and Lou Fancher. Lionni’s book is a great example of two primary colors on their own and mixing, while My Many Colored Days features a broader array of colors. Participants seemed to particularly enjoy the rhyming words and animals seen in the second book. After reading, we worked as a group to assemble large pieces of painted cardboard into a big sculpture. Guests enjoyed building with pieces that were life-sized for some. One child used a few smaller pieces to make a rocket and proceeded to fly it above their head. With the mechanics of attaching pieces with notches in mind, guests were welcomed to create their own sculptures on a smaller scale. They were able to use the earlier mentioned pieces of cellophane to experiment with color, light, and sculpture-making. It was great to see people discovering how colors could change when layered on top of one another. While pieces already had cuts in the edges for attaching, scissors were available in case guests wanted to make their own slots. They also came in handy for widening some existing slots. Some guests decided to take the pieces they were working with home to use in the future while others were happy to experiment for a short time before moving to something else. And then there were some who couldn’t get enough of building with the large cardboard pieces and went right back to those after testing out some color mixing. I was happy to have seen so many visitors engage with the materials in different ways. This entry was posted on Monday, September 17th, 2018 at 10:51 am and is filed under Internship Program, Light, Nature, Sculpture. You can follow any responses to this entry through the RSS 2.0 feed. You can leave a response, or trackback from your own site.